"As things stand, the banks are the permanent government of the country, whichever party is in power." On March 20, 2014, European Union officials reached an historic agreement to create a single agency to handle failing banks. Media attention has focused on the agreement involving the single resolution mechanism (SRM), a uniform system for closing failed banks. But the real story for taxpayers and depositors is the heightened threat to their pocketbooks of a deal that now authorizes both bailouts and "bail-ins" - the confiscation of depositor funds. The deal involves multiple concessions to different countries and may be illegal under the rules of the EU Parliament; but it is being rushed through to lock taxpayer and depositor liability into place before the dire state of Eurozone banks is exposed. Under the deal, after 2018 bank shareholders will be first in line for assuming the losses of a failed bank before bondholders and certain large depositors. Insured deposits under 85,000 ( 100,000) are exempt and, with specific exemptions, uninsured deposits of individuals and small companies are given preferred status in the bail-in pecking order for taking losses . . . Under the deal all unsecured bondholders must be hit for losses before a bank can be eligible to receive capital injections directly from the ESM, with no retrospective use of the fund before 2018. As noted in my earlier articles, the ESM (European Stability Mechanism) imposes an open-ended debt on EU member governments, putting taxpayers on the hook for whatever the Eurocrats (EU officials) demand. And it's not just the EU that has bail-in plans for their troubled too-big-to-fail banks. It is also the US, UK, Canada, Australia, New Zealand and other G20 nations. Recall that a depositor is an unsecured creditor of a bank. When you deposit money in a bank, the bank "owns" the money and you have an IOU or promise to pay. Under the new EU banking union, before the taxpayer-financed single resolution fund can be deployed, shareholders and depositors will be "bailed in" for a significant portion of the losses. The bankers thus win both ways: they can tap up the taxpayers' money and the depositors' money. But at least, you may say, it's only the uninsured deposits that are at risk (those over 100,000--about $137,000). Right? Not necessarily. According to ABC News, "Thursday's result is a compromise that differs from the original banking union idea put forward in 2012. The original proposals had a third pillar, Europe-wide deposit insurance. But that idea has stalled." 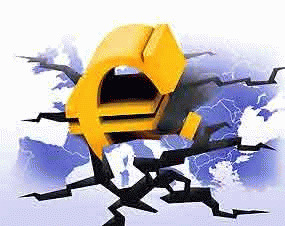 [T]he third pillar, sadly ignored, [is] a joint deposit-guarantee scheme in which the costs of making insured depositors whole are shared among euro-zone members. Annual contributions from banks should cover depositors in normal years, but they cannot credibly protect the system in meltdown (America's prefunded scheme would cover a mere 1.35% of insured deposits). Any deposit-insurance scheme must have recourse to government backing. . . . [T]he banking union--and thus the euro--will make little sense without it. All deposits could be at risk in a meltdown. But how likely is that? Pretty likely, it seems . . . .
European banks, like all banks, have long been hermetically sealed black boxes. . . . The only thing known about the holes in the balance sheets of these black boxes, left behind by assets that have quietly decomposed, is that they're deep. But no one knows how deep. And no one is allowed to know - not until Eurocrats decide who is going to pay for bailing out these banks. "The effectiveness of this exercise will depend on the availability of necessary arrangements for recapitalizing banks ... including through the provision of a public backstop. . . . These arrangements must be in place before we conclude our assessment." The truth shall not be known until after the Eurocrats decided who would have to pay for the bailouts. And the bank examinations won't be completed until then, because if any of it seeped out - Draghi forbid - the whole house of cards would collapse, with no taxpayers willing to pick up the tab as its magnificent size would finally be out in the open! Only after the taxpayers - and the depositors - are stuck with the tab will the curtain be lifted and the crippling insolvency of the banks be revealed. Predictably, panic will then set in, credit will freeze, and the banks will collapse, leaving the unsuspecting public to foot the bill. What Happened to Nationalizing Failed Banks? Underlying all this frantic wheeling and dealing is the presumption that the "zombie banks" must be kept alive at all costs - alive and in the hands of private bankers, who can then continue to speculate and reap outsized bonuses while the people bear the losses. [I]n almost every case of recent banking crises in which emergency action was needed to save the financial system, the most economical (to taxpayers) method was to have the Government, as in Sweden or Finland in the early 1990's, nationalize the troubled banks [and] take over their management and assets ... In the Swedish case the end cost to taxpayers was estimated to have been almost nil. Typically, nationalization involves taking on the insolvent bank's bad debts, getting the bank back on its feet, and returning it to private owners, who are then free to put depositors' money at risk again. But better would be to keep the nationalized mega-bank as a public utility, serving the needs of the people because it is owned by the people. [T]he financial sector needs more than just regulation; it needs a large measure of public sector control--that's right, the n-word: nationalisation. Finance is a public good, far too important to be run entirely for private bankers. At the very least, we need a large public investment bank tasked with modernising and greening our infrastructure . . . . [I]nstead of trashing the Eurozone and going back to a dozen minor currencies fluctuating daily, let's have a Eurozone Ministry of Finance (Treasury) with the necessary fiscal muscle to deliver European public goods like more jobs, better wages and pensions and a sustainable environment. A giant flaw in the current banking scheme is that private banks, not governments, now create virtually the entire money supply; and they do it by creating interest-bearing debt. The debt inevitably grows faster than the money supply, because the interest is not created along with the principal in the original loan. For a clever explanation of how all this works in graphic cartoon form, see the short French video "Government Debt Explained," linked here. The problem is exacerbated in the Eurozone, because no one has the power to create money ex nihilo as needed to balance the system, not even the central bank itself. This flaw could be remedied either by allowing nations individually to issue money debt-free or, as suggested by George Irvin, by giving a joint Eurozone Treasury that power. The Bank of England just admitted in its Quarterly Bulletin that banks do not actually lend the money of their depositors. What they lend is bank credit created on their books. In the U.S. today, finance charges on this credit-money amount to between 30 and 40% of the economy, depending on whose numbers you believe. In a monetary system in which money is issued by the government and credit is issued by public banks, this "rentiering" can be avoided. Government money will not come into existence as a debt at interest, and any finance costs incurred by the public banks' debtors will represent Treasury income that offsets taxation. New money can be added to the money supply without creating inflation, at least to the extent of the "output gap" - the difference between actual GDP or actual output and potential GDP. In the US, that figure is about $1 trillion annually; and for the EU is roughly 520 billion ($715 billion). A joint Eurozone Treasury could add this sum to the money supply debt-free, creating the euros necessary to create jobs, rebuild infrastructure, protect the environment, and maintain a flourishing economy.